This issue of Psychiatric Clinics, edited by Drs. Dan Blazer and Susan Schultz, will cover a number of important aspects of Geriatric Psychiatry. 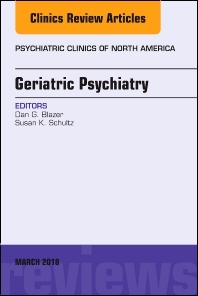 Topics in this issue include, but are not limited to: Delirium in the elderly; Depression and cardiac disease in later life; Schizophrenia in later life; Anxiety Disorders in later life; Neurological changes and depression; Behavioral Changes with Alzheimer’s Disease and Vascular Dementia; Palliative Care in Dementia and Chronic Mental Illness; Collaborative Care for the elderly with psychiatric disorders; and Post Traumatic Stress Disorders in the elderly.